ASOBITUNES Release Tour Comes Back to VISION. “ASOVISION”’s ASOBITUNES Release Tour started in July right here in VISION. 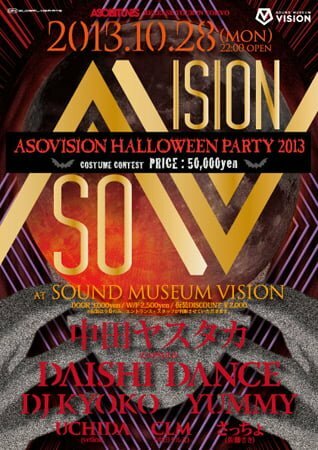 After 3 months of their tour, they are coming back to VISION for Halloween. YASUTAKA NAKATA, DAISHI DANCE, DJ KYOKO, YUMMY and other popular act will perform. This will be wild party!